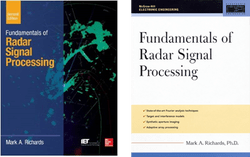 A collection of resources is available to instructors of classes using Fundamentals of Radar Signal Processing as a required textbook. Resources may be requested by contacting the author at ﻿mrichards@ieee.org﻿. An extensive set of Powerpoint lecture slides. These are from the last time the author taught Georgia Tech's ECE6272, a one-semester graduate course also titled "Fundamentals of Radar Signal Processing". However, I last taught that course in the Fall 2012 semester, so the slides predate the second edition and are getting a little dated. The MATLAB demonstrations provided publicly elsewhere on this site.